My interest in John Wanamaker dates from September 1953 when, as a student at the Reformed Episcopal Theological Seminary in Philadelphia, I was employed as the Assistant to the Minister at the Bethany Temple Presbyterian Church, Fifty-third and Spruce Streets in Philadelphia, PA.
John Wanamaker was the founder of Bethany Temple in 1906. His wife had donated monies for the church organ. In 1956 I became the minister of the church and found that my office was located on the first floor of the memorial tower built to honor the founder. Many stories were related to me by the members of the church about their acquaintance with Mr.Wanamaker. At that time, I had no idea how prestigious and important he was, not only in business or church affairs, but in civic and national matters as well. 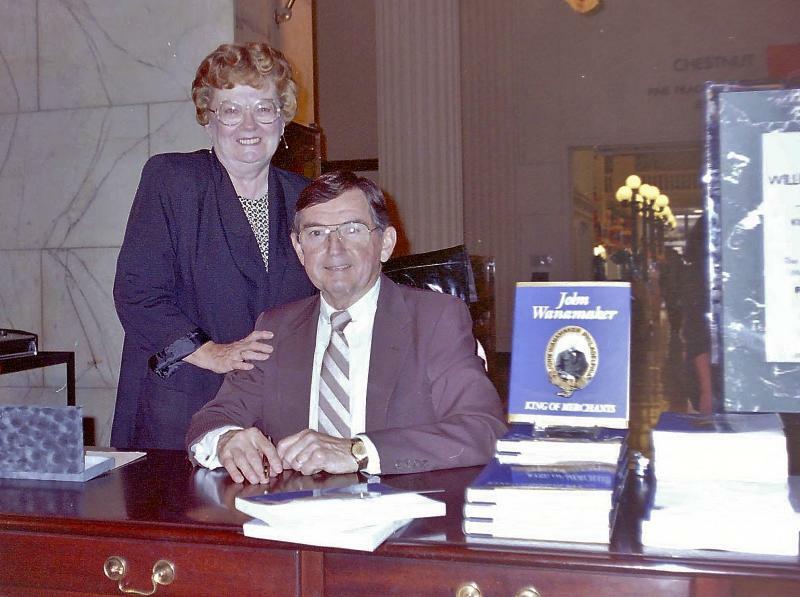 But in 1988, long after I had left the pastorate and was the Assistant to the President at Eastern College (now University), I read in the newspaper that the John Wanamaker stores had been sold. In itself, that news did not affect me. I noted, however, that most of the records of the store had been given to the Historical Society of Pennsylvania at Thirteenth and Locust Streets in Philadelphia . That piqued my interest. I contacted HSP explaining my past involvement at one of the churches Wanamaker founded and my interest is looking at the records. Miss Linda Stanley, in charge of collections, explained to me that the records were in large cardboard boxes yet to be unpacked and that there might be as many as a million documents to be processed. Moreover, HSP did not have anyone to do the work and no money for it. Interestingly enough, I was currently taking courses in Library Science at Villanova University halfway through a degree. I had taken a course in Archival Development and had familiarity with the work that needed to be done. “Could I help?” Ms. Stanley responded by stating that my help would be appreciated but they would not be able to pay me. I volunteered. Upon requesting a sabbatical leave from my position at the college, I was told by the President that such was not granted but that I could be absent from my office one day of the week provided I kept fulfilling my work-load. Starting in October 1988, I spent one day a week at HSP unpacking the boxes, developing an inventory, and filing all paper documents in acid-free folders and archival boxes. The first several boxes contained personal correspondence of Mr. Wanamaker, not only to his wife and family members, but also to friends, employees and some customers. Other letters were from Mrs. Wanamaker and other members of the family. Most were still in stamped envelopes, having been returned to the office for the record’s sake. I could not believe what I was seeing and handling. Because I was a volunteer, working at my own pace, I read through many, many personal letters and was amazed and impressed with this man and his wife. The devotion, love and concern between the husband and wife, as well as their children was so impressive. Furthermore, the down-to-earth mannerisms of this famous businessman in his dealings with customers seemed to me to be most unusual. It was not long before I realized that nothing had been published about him since the 1920’s and new information needed to be included in an up-to-date book. After evaluating all the pros and cons, and determining with my wife as to how our home expenses could be met, I resigned my position at the college and devoted full-time to the research required to write a book. My intention was to write a biography of John Wanamaker. I wanted it to be far more than a story of his business, it had to include his family, and his life as a Christian. Isabel and Bill at book sigining, 1993.